Cream the ghee with salt & then add a little flour at a time. Beat the eggs & add this to the mixture. Knead well to form a dough & then roll out the dough to 5 mm. thickness. Cut with the tartlet mould & press each cut out into the mould. Prick the bottom of the tartlets with a fork & place them on a baking tray. Bake at 180C in a pre-heated oven for about 15 mins or till they turn light brown in colour. Remove from the oven & let it cool down. 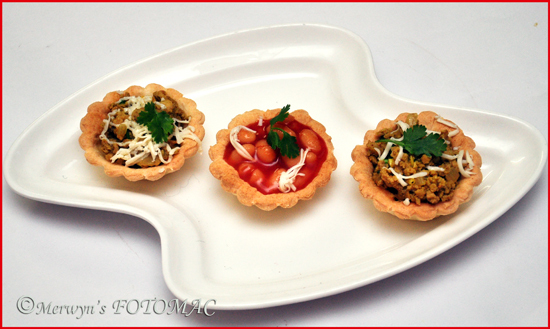 Remove the tartlets from the moulds & place on a serving plate. Fill the savoury baskets with fillings of your choice. ¼ tsp. Garam Masala pwd. ¼ tsp. Red Chilli pwd. Heat oil in a wok/kadhai/ pan. Add onions, chillies, ginger-garlic & saute till onions turn soft & translucent. Then add turmeric pwd., chilli pwd., garam masala pwd., sugar & stir well. Add tomatoes & cook till soft. Add mince & saute well. Add a cup of water & vinegar & stir well. Let it cook on low heat for about 30 mins. When the mince is cooked, continue to stir till it is dry. Remove from heat & fill into the mini savoury baskets. Heat oil in a wok/kadhai/pan till hot. Reduce heat & add onions, garlic & ginger. Saute till the rawness disappears & onions turn soft. Add the baked beans & stir well. Cook for a minute. Adjust salt to taste. Switch off the heat. Fill in the mini savoury baskets. Garnish with cheese & coriander & serve. Mushrooms & peas, flaked tuna/sardines(tinned), boiled & flaked chicken & mayo, Russian salad, chopped ham/bacon & cheese, chicken pineapple, boiled & grated eggs & cheese… etc. Hi Aunty Hilda..I love this recipe. Would you also please put up a recipe to make Goan sausages from scratch? For those of us not living in India..it would be a real treat to be able to make them!